Straight of the catwalk from his latest collection, Henry Holland present this bright and bold woolen dress featuring a fit and flare shape with contrasting purple, yellow and pink striped block panels with short-sleeves and a high neck. His playful, irreverent designs often still incorporate sense of humour or, like these three from his AW12 collection sold at Urban Outfitters, lots of obnoxiously bright colours. I want all three of these. 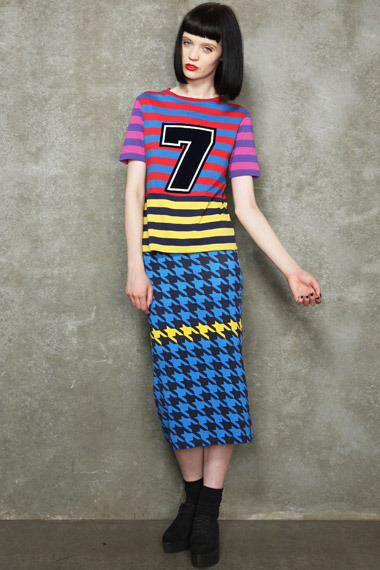 House Of Holland bring you this bold t shirt from their Autumn/ Winter 2012 collection featuring different coloured striped panels throughout with a velvet number 7 at the front; finished with short sleeves and a rib knit crew neckline. The London based designer brings you this on trend, midi jersey dress from their latest collection featuring a brightly coloured zig-zag print throughout with a crew neckline and long sleeves.